Congratulations, you've been published! Now it's time to celebrate your accomplishments and launch your book. 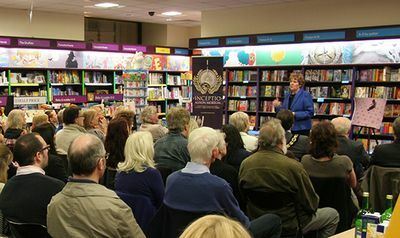 Whether you’re considering a small launch party with family and friends, or a large bookshop launch open to the public, it's important to host the launch in a professional way, underlining your credibility as an author. Make sure you know who’s supplying the books - you or the venue’s usual supplier? Find out about invoicing procedures and any special arrangements the venue has for payment. Print promotional materials such as flyers, bookmarks and postcards. Feature your book cover, ISBN, a short synopsis and the price. Invite everyone you know. It’s encouraging to have support on the day, and also the venue will be delighted if you bring an audience (i.e. customers!) with you. Get to the venue early so you have time to set up and make sure everything is how you want it. Be chatty, charming, and friendly. People may not buy today, but they could remember you, buy later online, and become loyal readers in the future. Prepare a reading - 3-4 minutes is probably enough. Always leave them wanting more. Have a guestbook for people to sign and leave their email address. Then you can catch up with them later and tell them about other events and special offers. Afterwards, follow up with venue staff. Ask if there’s anything you could have done differently and use any feedback for future events. Blog, post and tweet about your event, the people you met and the things you learned (always include a link to your book). If you are thinking of a bookshop launch, buy some books there and become known to the staff. Make an appointment to go and see the owner or events manager. Before making an approach, ensure your book is on Nielsen Bookdata, have your Advance Information Sheet in your hand, and a good quality business card. Think about how you’re going to publicise the event. If you’ve got a 'name’ to agree to come along to your launch, mention this as part of your pitch. If you are doing a talk or reading, practice it! Offer drinks, both alcoholic and soft. You don’t need fancy canapés, but some nibbles would be nice. If you are selling your books, be sure to take plenty of change. Get someone to help as a cashier. Bring artefacts relating to your story to use as conversational topics and for demonstrations to make the launch more lively. Smile. The audience came to see you. They want to hear what you have to say and they want to hear about your book. For more in-depth book marketing information and advice, we recommend Sell Your Books! A book promotion handbook for the self-published and indie author by PR and marketing expert Debbie Young.